The BRIDELA fire blankets fully comply with the requirements of the British/European standard BS EN 1869 and have been independently tested and certified accordingly. It is available in a variety of standard sizes and has the added benefit of over 25 years of fire protection experience behind it. Efficiently packaged in a choice of containers (flat pack or tube pack) for domestic or industrial use, these fire blankets, when draped over a fire, smother the danger by starving the fire of oxygen. 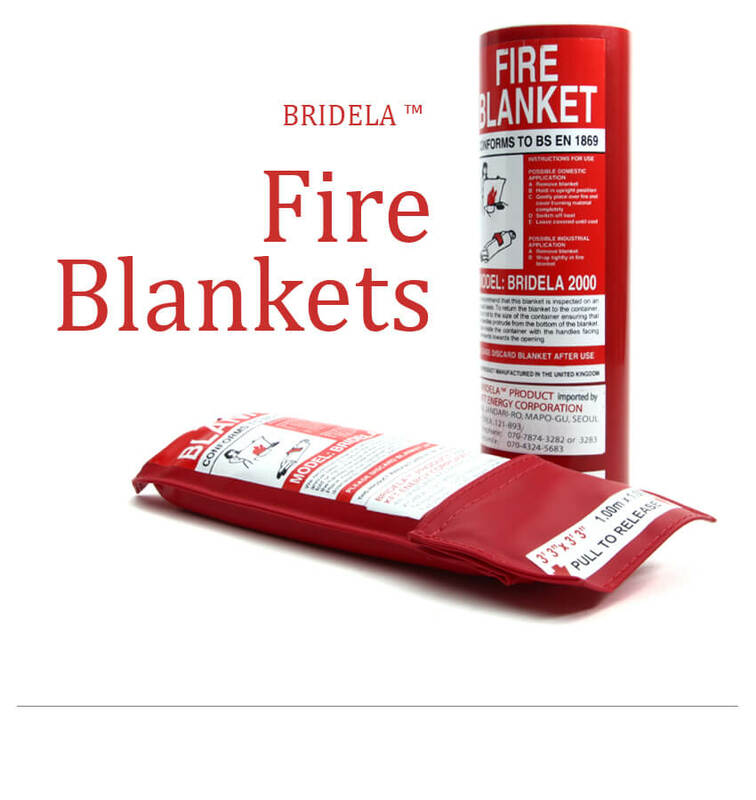 The BRIDELA fire blankets can also be used to wrap around a person whose clothes are on fire. Suitable for use in a variety of different environments including kitchens, factories, offices, caravans, stores, schools, restaurants, hotels, boats, nursing homes, shops, laboratories, etc. Fire blankets, when used correctly, prove to be highly life saving. They should be made easily accessible near an exit doorway. And should never be hidden away in draws or cupboards. Placing them near to an exit ensures that you have away out should the fire blanket not be enough or if things go wrong. Fire blankets are also ideal for covering someone who has actually caught fire and can also be worn over the head if one need to pass an area that is on fire or under extreme high temperature. Every home should have a fire blanket located in the kitchen or where cooking takes place. The protection it provides to one's family sets off the minimal cost involved in its purchase. These blankets provide highly effective protection in homes, restaurants and kitchens that are susceptible to rapid fire spread and destruction. The various fire suppression products are produced from amorphous, silica cloths and felt which are absolutely fireproof and cannot melt until temperatures exceeding 3000 deg F. It can be reused multiple times. 36" x 36" fabricated blanket with holding handles attached at one end for easy handling and utility of use. Packaged in an attractive ABS plastic wall attachment, offered in the colors of black, white, or chromium. Ideal for apartments, RV's, or boats, where space is at a premium.